The Bojana or Buna, is a 41 kilometer long river in Albania and Montenegro which flows into the Adriatic Sea. 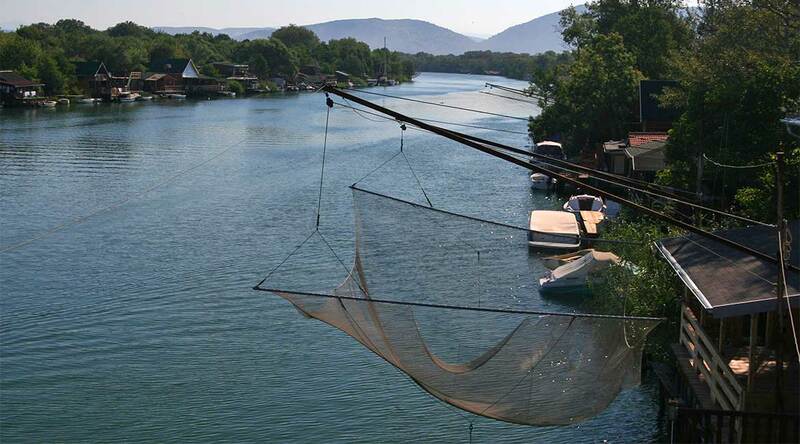 An outflow of the Skadarsko Jezero, measured from the source of the lake’s longest tributary, the Morača, the Morača-Lake Skadar-Bojana system is 183 kilometer long. The river used to be longer, but due to a rise in the level of the Skadarsko Jezero, the uppermost part of the river is now under the lake’s surface. The river initially flows east, but after only few kilometers reaches the city of Shkodër and turns to the south. On the southern outskirts of the city, the river receives its most important tributary, the Great Drin, the greater part of which became its tributary after changing course during a flood in 1858 and now brings ten times more water than the Bojana itself. After flowing around the peak of Tarabosh, it passes through the villages of Zues, Bërdicë, Tarragjat, Oblikë, Obot, Shirq, Dajç and Goricë. After 20 kilometers in Albania, it forms the border between Albania and Montenegro. On this border section, which is 24 km long, the river meanders widely, flowing around Lakes Šas and Zogajsko blato, both in Montenegro. Settlements include villages of Sveti Đorđe and Reč on the Montenegrin, and Luarzë and Pulaj on the Albanian side. The area surrounding the river in this section is low and marshy, the Bojana being the eastern border of the field of Ulcinj and of the 12 kilomter-long beach of Velika Plaža at Ulcinj. At its mouth into the Adriatic the Bojana forms a small delta with two arms, the left one forming the border with Albania, and the right one, with the island between the arms, being part of Montenegro. The island is called Ada Bojana, Ada the Turkish word for “island”, has found its way into the Montenegrin language. It was supposedly formed around a ship’s wreck in the 19th century, and now covers an area of 6 km2, and is Montenegro’s largest island. With the neighboring resort of Sveti Nikola, it is a major center of nudism along the Adriatic. The other, smaller island belongs to Albania and is called Franc Jozeph Island or ‘Ada Major’. This small island is not artificial such as Ada Bojana but natural. The Island of Franz Joseph frequently receives tourists. Despite being short, the river has quite a large watershed, covering 5,187 km², because the whole drainage area of the Skadarsko Jezero, the largest lake in southeastern Europe, is also part of it. Also, thanks to the waters from the Great Drin, the Bojana ranks second place among all tributaries to the Adriatic, measured by the annual discharge, after the Po in Italy. The Bojana is navigable throughout its whole course, depending on the size of your boat. Both foreign and domestic experts have already identified 143 different species of fish in the delta of the river. Although it has got a big flow, sea water rushes deeply upwards through its riverbed. Thus the first peculiar duality is created. In its riverbed there is both salty sea water and sweet river water. At the mouth of the Bojana river in the Adriatic Sea there are many wooden houses located directly on the river. These are largely hidden between the reeds and the other crops. It increases in quantity the closer it comes to the sea and the Ada Bojana island. Ada Bojana Apartmani – This property is 9 minutes walk from the beach. Boasting barbecue facilities, a garden as well as a terrace, Ada Bojana Apartmani is set on the banks of Ada Bojana rivert, within 14 kilometer of the Old Town of Ulcinj. Complimentary WiFi is provided. Each unit comes with air-conditioned bedrooms and a kitchen with a fridge. A terrace with river views is offered in each unit. A continental breakfast is available each morning at the country house. Facilities : Free Wi-Fi Internet, Free Parking, BBQ Facilities, Terrace, Garden, Outdoor furniture, River view, Garden view, Pets allowed, Concierge service, Airport shuttle (additional charge), Express check-in/check-out, Grocery deliveries (Additional charge).